Hi, My name is Ian. 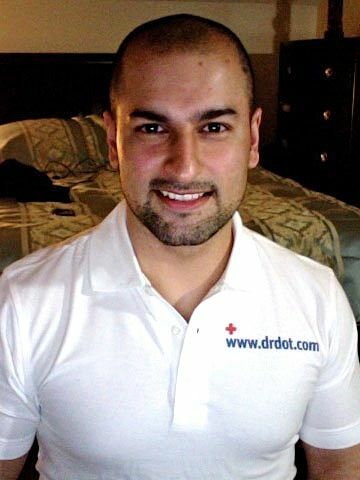 I’m a Registered Massage Therapist in Toronto, ON. I was born and raised in Wales and moved to Toronto a few years ago. I initially became interested in massage while working with young people with physical disabilities in the UK and seeing just how beneficial this type of therapy can be, be it treating a specific condition or simply to enhance a general feeling of well-being. I graduated from Trillium College in Toronto and passed the Provincial Board exams in 2014. In all my work, my goal is always to provide individualized treatment to achieve the most beneficial results for my client. 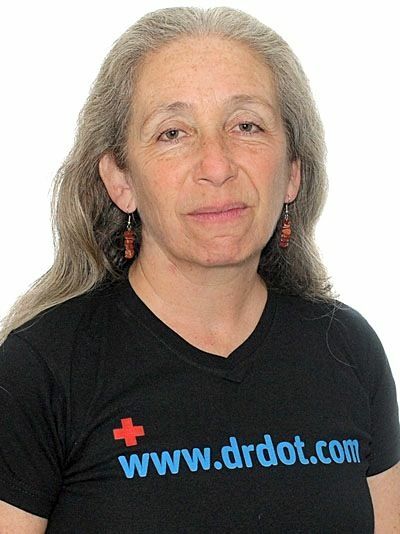 I focus every treatment on the specific client need or area of concern and provide a number of treatment modalities including Swedish techniques, deep tissue, myofascial release and trigger point therapy. I have treated clients with a variety of concerns, from post-race treatments at sporting events to those dealing with long-term stress and anxiety. This summer, I am also looking forward to working at the Athlete’s Village for the 2015 Pan Am Games in Toronto. 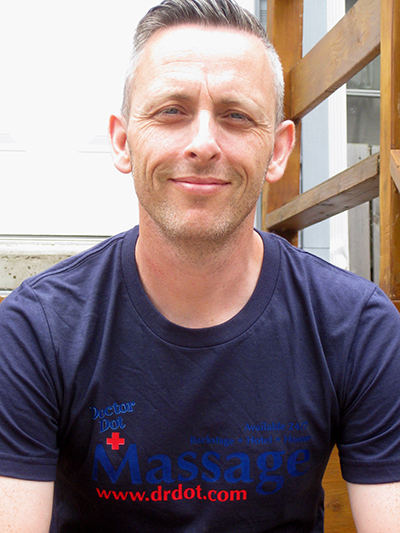 I am fully insured and a member in good standing of the College of Massage Therapists of Ontario (CMTO). I look forward to meeting you when you’re in our fantastic city! Hi my name is Kelli. I practice Tuina Massage which is one of the main modalities of Chinese Medicine. Tuina massage uses specific points along the meridians in the body to bring back balance and release stress and pain. I am also a Registered Acupuncturist and Nutritional Consultant. Acupuncture has many health benefits and can be an important addition to any massage. 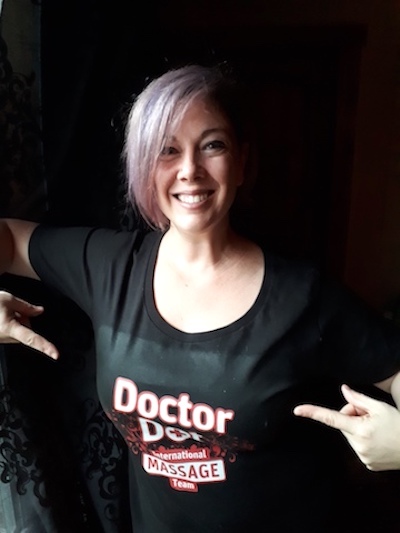 I am excited to be part of the Dr. Dot team and look forward to meeting you in Montreal!! My name is Tanya from Regina, SK in Canada. 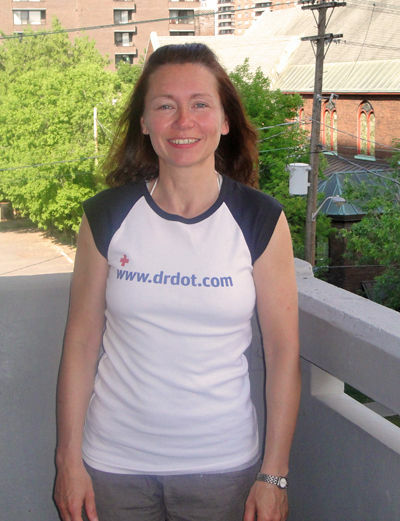 I was valedictorian of my graduating class in 2008, I immediately began working in a small physiotherapy clinic in Regina. Shortly there after I found a full time position as a massage therapist working at a hospital with a well known physiotherapist and two other acupuncturists who also specialized in massage therapy. In the future I also plan to upgrade my education into soft tissue release as well as acupuncture. I also do massage weekly at a spinal cord injury rehabilitation center which specializes in helping those who have been affected by these types of injuries. I am available to tour with a band on contract if necessary. 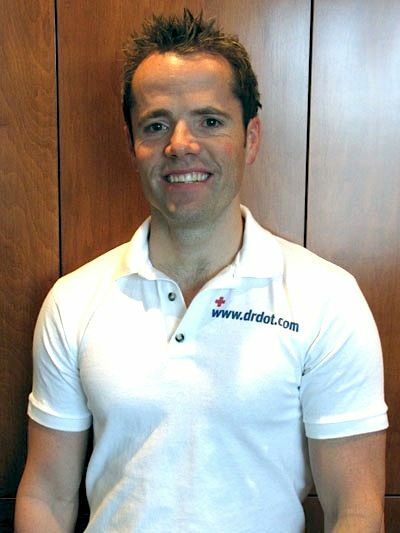 Dr. Jason is a board certified chiropractor practicing in Edmonton, Alberta, Canada. 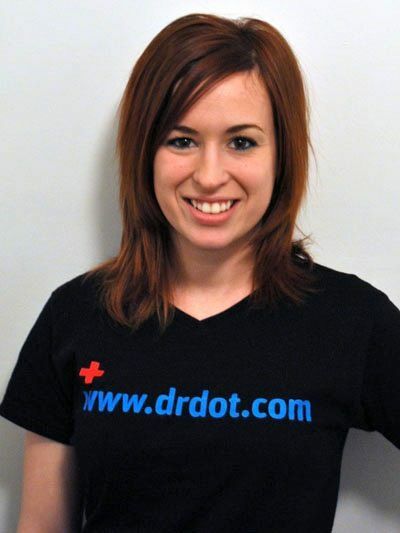 He owns and operates two chiropractic and wellness clinics in Edmonton and has over 10 years of practice experience. Dr. Jason is an expert in manual adjustment of the spine and extremities. Dr. Jason was born and raised in Edmonton where he graduated from the University of Alberta with a Bachelor of Commerce degree. He then went on to graduate, with honors, from the prestigious Palmer University in the San Francisco Bay area. With almost 10 years of university education, you can be assured that you are in good hands (no pun intended!) with Dr. Jason. Dr. Jason enjoys working with the entertainment community and understands the importance of good health and wellbeing as it relates to the performance of both band members and their crew. You can be assured that you will always be treated with dignity, professionalism, a commitment to privacy, and the best chiropractic adjustment you have ever had. Dr. Jason looks forward to helping you be and feel your best. 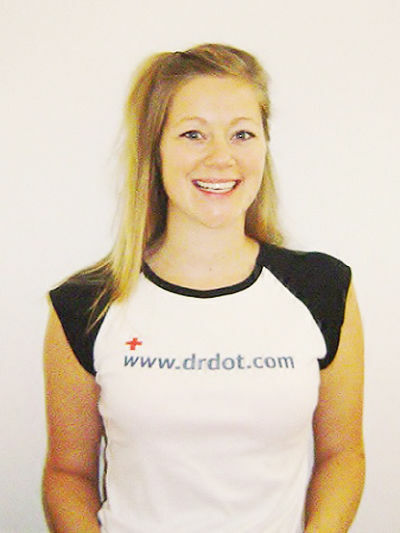 Hi everyone, I'm Emilie a licensed certified massage therapist from Montreal, Canada. What an amazing city! I speak english, french, spanish and little bit of greek. I have done a lot of massages on anyone, from business professionals, sportsmen, pregnant women, child and of course, people who wants a good strong massage, cause yes, I’ve got strong hands. I'm passionate about massaging because of all the beneficials effects it can bring to both your body and soul. I am specialized in therapeutic/deep tissue massage, I practice also swedish, californian, reflexology, hot stones and hot seashells massages (a Polynesian technique). With my "magic hands" I give very personalized treatment as every people is different in their needs and requests. As a creative and intuitive person, I'm always concentrate on what my clients really needs. I’m a passionate person, not only for massaging but for music too! I grew up in a family of musicians, all my sisters and my parents play at least one instrument. For my part, I play piano since I’m 4 years old. I love almost all kinds of music, but I must say that I’ve a preference for punk-rock, rock, metal, pop…well…everything is good to my ears. Since I’m 15, I love to go see some shows and now, I’m so thankful to have the chance to combine my passion of massage and music. Thank you Dr. DOT! I also may be available to travel across Canada, US and Internationally if you need too. I look forward to working with you and to make it a wonderful experience you will never forget! Hey, my name is Katrin. Only a few weeks ago I came from Europe to Ottawa. Hi. I’m Sandy. My passion is reflexology which I have practiced for more than 13 years. This therapy is remarkable for its capacity to profoundly remove energy blockages in the body, restoring natural circulation and deep relaxation. My certification is from the Reflexology Association of Canada. For those who prefer a body massage, I combine my learning in Californian and Shiatsu techniques with Reiki, Body talk therapy, and elements of the pressure points on your feet to relieve tensions and help you to completely relax. Originally from Toronto, I have lived and worked in Quebec for most of my adult years, except for on many Saturdays when I would travel across the border/river to offer foot massage at the Ottawa organic market. Over the last five years, I have had the amazing opportunity to experience another of my passions – living and working in Africa. When I wasn’t busy with a development project, most of my time was spent building a practice in massage; treatment and training in reflexology, which was not well known in that part of the world for its healing effects. I was always happy to receive someone who knew what they needed to improve their health and knew where to ask to get it. They would leave satisfied, and I would be too, to know I was able to help. As a member of Dr. Dot’s team, I would love to offer you my massage or reflexology services so that you too may feel renewed and energized. Dr. Pawan is a licensed chiropractor in the Province of Ontario, Canada. He has been in practice for 3 years thus far and specializes in soft tissue muscular rehabilitation with certifications in Graston Techniqe, Myofascial Release Technique, and NIMMO trigger point therapy. He has treated patients of a vast variety, including dancers, athletes, motor vehicle accident patients, sports teams, and those suffering from chronic wear and tear injuries. Dr. Pawan takes a holistic approach to treating his patients, integrating nutrition, soft tissue muscular rehabilitation, and lifestyle changes along with traditional chiropractic manipulative adjustments. In order to give long term relief to his clients, he believes you must treat all aspects related to the injury, rather than just giving a simple adjustment. In his spare time, he is a singer, dancer and choreographer. These pass times allow him to understand the mechanism of injury and key areas to address when treating singers, actors, musicians and dancers. In his 3 years in practice, to date, he has worked in MVA /extended health clinics, sports injury clinics and Spinal Decompression Centers. All clinics were/are of a multi-disciplinary nature, which he believes is the most effective setting for a patient to receive the optimal level of care.